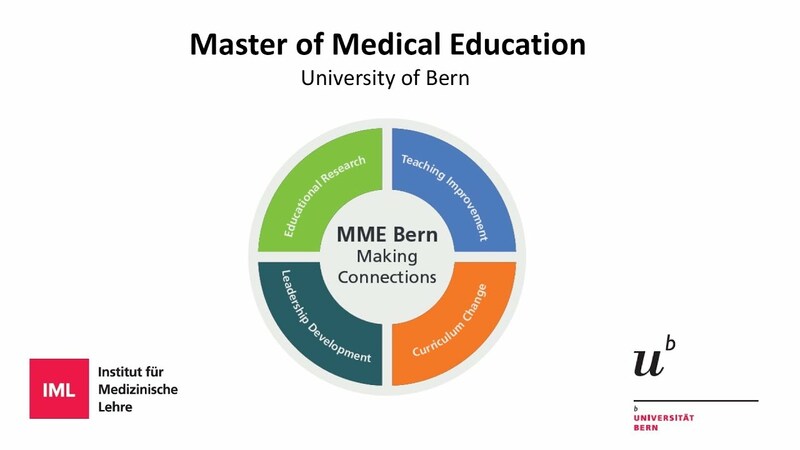 The Master of Medical Education Programme Bern (MME Bern) is a part-time, postgraduate Master of advanced studies in medical education provided by the Medical Faculty of the University of Bern. It was developed in collaboration with the University of Illinois in Chicago and was established in 1999. The study programme follows a systematic, evidence-based approach, and thus prepares participants for the growing demands in initial and continuing education in the healthcare sector. The MME programme involves international experts and is directed towards graduates of all healthcare professions alongside their employment. The programme requires the participants’ presence at course weeks which are offered over two years.